Between Terence Eden (@edent) and I we have spotted a hole in the social network Du Jour ‘Google+’ . How can you create a circle of your friends for a topic if you dont know if they would want to join ? 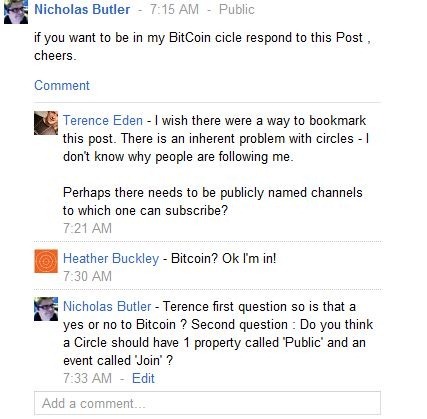 For instance; I am creating a circle for BitCoin and want to invite people to join. 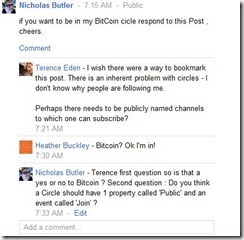 Terence goes a little further and wonders what circles people have created to include him in. Whilst I for myself would not want to know what circles I might be in ( intimate ones or the 7th of Hell ones ? ) I might be interested in making some of my Circles public. Though I can see that being abused by online bullies wanting to make statements in the same way they did with twitter lists.